OREA Reports Toronto Land Transfer Tax has a Huge Negative Economic Impact. The report conducted by Altus Group Economic Consulting, says the economic losses incurred by the City of Toronto between 2008 and 2013 included a loss of 38,278 resale home transactions, a loss of $2.3 billion in economic activity, a reduction of $1.2 billion in GDP, a loss of 14,934 full-time jobs and a loss of $772 million in wages in salaries. This is a huge price to pay for an additional $300 million in municipal tax revenue. Last year I wrote a research paper on the effects of the Toronto Land Transfer Tax (LTT) on the municpality for my Urban Studies course at the University of Toronto. 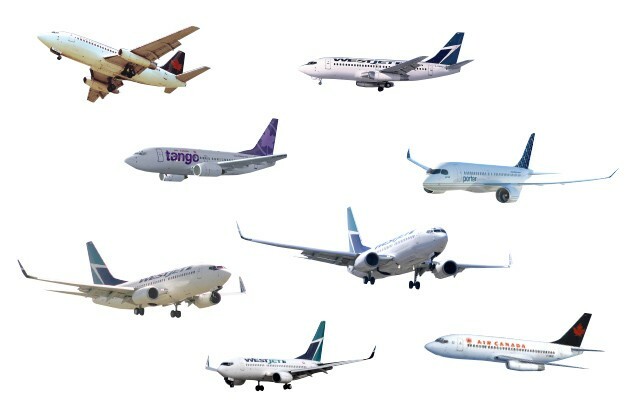 If you would like to read up on the history of the Toronto LTT and how other countries have fared with similar taxes, the research paper can be found here: Implications of the Toronto LTT. The first phase of the revitalization of Alexandra Park has begun! There are few opportunities left in downtown Toronto where redevelopment can actually change the streetscape of the city. 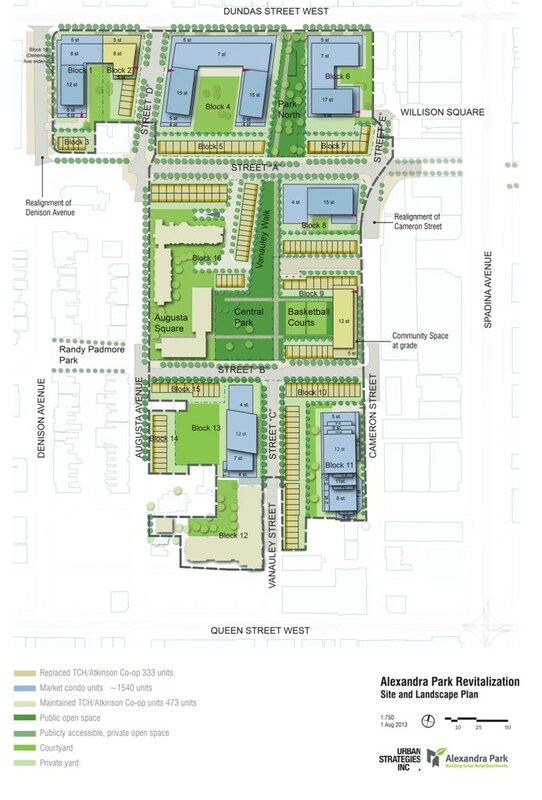 The revitalization of Alexandra Park promises to be one of the most profound – if development goes through as planned, Augusta Ave. one of the few gateways to Kensington Market will be extended through the development allowing through traffic to extend from Queen W. up to College. In addition, more storefronts will be built along the south side of Dundas St. W. as part of the mid-rise market condominium units slated for the location, making the section on Dundas W between Spadina and Bathurst a much more walkable and lively thoroughfare. It is anticipated that the entire project will take up to 10 years to complete. Tridel, the city’s private partner, will refurbish 473 rental units, replace 333 rental units with new apartments, and build 1,540 new condos, some in buildings up to 13 storeys high. Tridel illustrates how the community will fit in to the surrounding area in their SQ Development website where sales are already taking in place for the first phase at Queen W. More info can also be found at the Toronto Community Housing website. Cyclists and Bike Lanes Have a Positive Impact on Shopping. 1. How can transportation infrastructure best serve urban businesses? among business owners? Is the current allocation of resources optimal? 2. Are cyclists good for business? for space with on-street parking? 4. 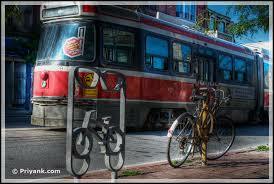 Can bike lanes and on-street parking coexist? Are configurations that accommodate both bicycle lanes and on-street parking more desirable where viable? Are they ever viable? Another interesting detail mentioned in the report was that “the perception that customers are likely to arrive by car in dense urban areas continues to be held by many retailers – even if other travel modes have firmly established themselves as the most popular. 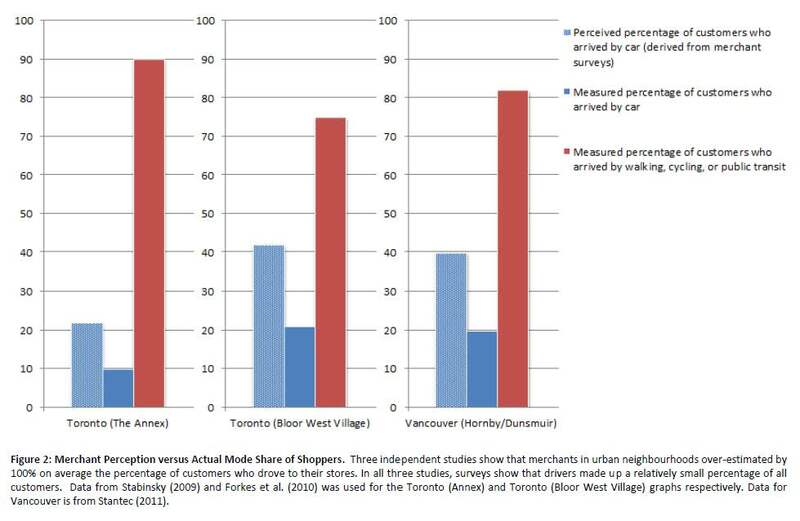 Studies conducted in downtown neighbourhoods of Toronto and Vancouver have shown that business operators tend to overestimate the number of customers arriving by car, and that the volume of customers who arrive by car is small in comparison to that of those who don’t (see graph below). In The Annex, a landmark Toronto neighbourhood where customers are more likely to arrive by cycling than by driving (12% cycling mode share vs. 10% car mode share), retailers overestimated the car mode share on average by 100%. Merchants from Bloor West Village, where car use is more prevalent, also over-estimated the number of drivers visiting their stores by 100%. 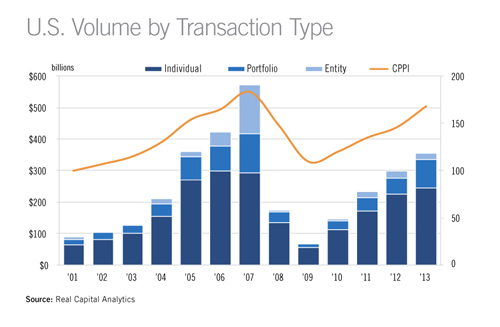 U. S. Commercial Real Estate Market in Recovery. “We need to open the lens a little wider to see the true devastation extending the runway at Billy Bishop would cause on the lakefrontFrom south Etobicoke to the Scarborough Bluffs and beyond, what is emerging all along the Toronto waterfront is one of the most remarkable transformations of its kind in North America or anywhere.The revitalization of a band of strategically located obsolescent lands is providing notable new and improved places for the public to enjoy: parks and trails, a linked series of neighbourhoods, places to live and work and places of recreation, repose and natural beauty. It’s “cottage country” in the heart of the city for the many hundreds of thousands who can’t afford Muskoka or a plane ticket to more exotic resort destinations. It’s also where Toronto is reinventing itself for the 21st century, adjusting to the city’s new southern face. Our waterfront is materializing not as a singular project but the collective work of generations of Torontonians, supported by the cumulative investments of all three levels of government and the private sector. “The construction crane may as well be the de facto symbol of Toronto with new buildings going up in just about every corner of the city. Although March data from Statistics Canada suggests that Ontario’s construction explosion is petering out after several big years for building, there’s still plenty of activity going on in Toronto’s condo market today. New projects are breaking ground in the upper reaches of North York all the way to the western waterfront. As of May 5th, there were 44,589 units under construction in the city. Using our Market Snapshot tool, we’ve crunched the numbers to find out which 10 neighbourhoods are seeing the highest construction concentration in the city. In first place, the Entertainment District has a staggering 5,565 condo units under construction. That’s roughly 12 per cent of all the units being built city-wide. This particular market won’t be letting up any time soon with 2,651 estimated completions scheduled for 2014 and 2,180 suites scheduled for 2015 so far. Toronto City Council has extend the monitoring period to the end of 2014 to allow staff to complete consultations on the effectiveness of the Mid-Rise Building Performance Standards. The Study recommends that many of the major arteries in the city including, in the Lower West End of Toronto, most of Dundas St. W and parts of College St. , Queen St. W. , Bloor St. W, Bathurst St. and Roncesvalles Ave. are permitted Mid-Rise, mixed commercial-residential development as of right. Mid-rise buildings are the ‘in between’ scale of building, they are bigger than houses but smaller than towers. Mid-rise buildings have a good scale and relationship to the street. They define or make walls to the street that are tall enough to feel like a city and provide lots of usable space, but low enough to let the sun in and open the view to the sky from the street. They support a comfortable pedestrian environment, and animate the street by lining the sidewalk with doors and windows with active uses including stores, restaurants, services, grade related apartments, and community uses. Mid-rise buildings may contain a single use like an office or residential apartment but they usually contain a mix of uses which may include retail, office, community service, and residential all in the same building. 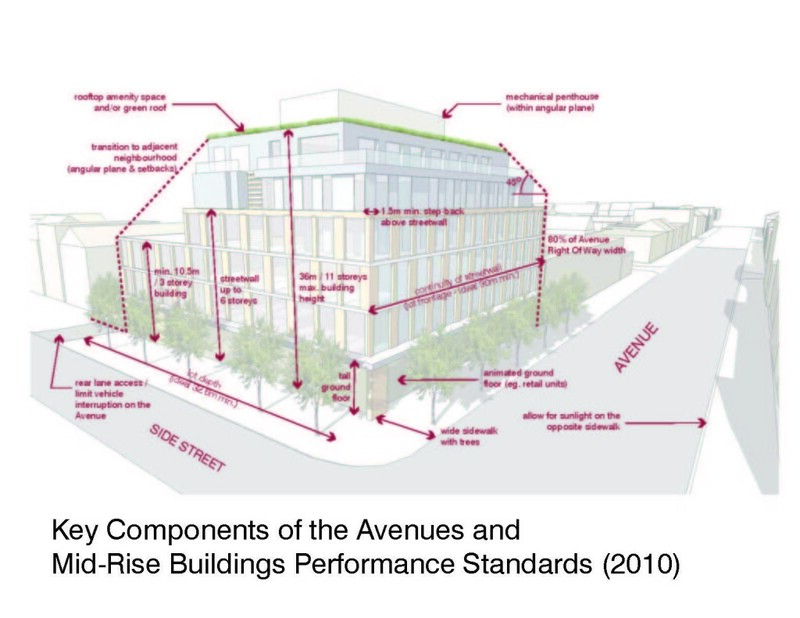 The height of a mid-rise building varies from street to street, as we define mid-rises as buildings that are no taller than the width of their adjacent street right-of-way (the width of the publicly owned portion of the street). In Toronto, on the narrower 20 metre wide streets in the downtown, a mid-rise is 5 or 6 stories high. On the wider arterial streets outside of the Downtown, a mid-rise may be taller up to a maximum of 11 storeys on the widest Avenues. Mid-rises typically are designed with step-backs or terraces at upper levels to make them appear lower in height from the street, and to allow sunlight and sky views on the sidewalk. Research and market observations have revealed that the new generation of employees is clear on what they want out of the ideal office space — with many of the preferences manifesting outside of the company’s walls. Employees want to be in areas where there is access to other talent and work in communities that are walkable, close to transit, and offer a compelling mix of residential, entertainment, and business options. These employees don’t want to balance work and life; they want it integrated. Those cities that offer this integration will be best positioned to attract top businesses and talent. Not only have office space needs and wants evolved, but so has overall space usage — presenting companies with new opportunities. The average square foot per person in a typical office has decreased by more than 300 square feet since the 1970s. 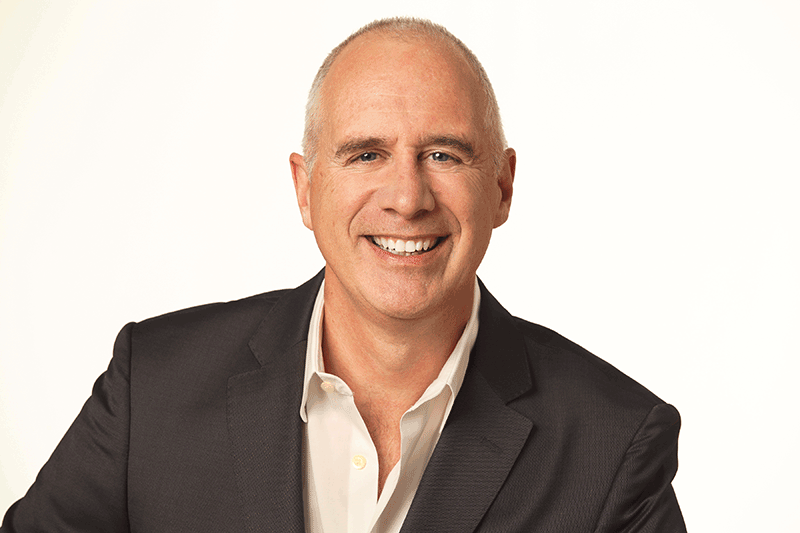 A typical company can move from a 100,000-sf class B space to 70,000-sf class A space, upgrading the environment for the same number of employees without affecting its bottom line. Tenants’ desire to be in higher-quality buildings and better locations, combined with the recession and a general lack of new supply over the last five years, presents pockets of opportunity for new office development. Many of these development opportunities are in primary markets where fundamentals support replacing functionally obsolete buildings. However, there will also be opportunities in business-friendly, secondary markets driven by low business costs, quality labor supply, friendly regulatory environments, strong economic growth climates, and a better overall employee quality of life.